BC’s Campus Op’s Get LEED Certified With New Tornado & Sonitaire Vacuums! This Spring Bellevue College’s campus op’s & custodial crew were re-armored with all new vacuum cleaners; including LEED certified Sanitaire uprights & Tornado backpack harness vacuums. The switch comes as the previous vacuum cleaners were deteriorating- containing no filters and outdated vacuum-bag attachments. BC’s custodial team have now moved towards two excellent models. 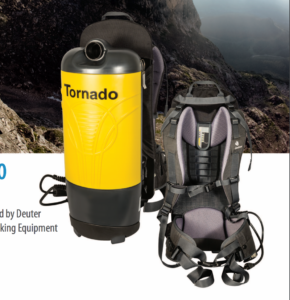 Tornado backpack’s boast a 4-stage filtration system with HEPA filters which contributes to improved indoor air quality. It also has a CRI Gold Seal of Approval. The pack also features a unique collaboration with DEUTER, who make some of the world’s finest hiking and outdoor recreation equipment to create one of the most comfortable harnesses available on the market. Aside from backpack vacuums, the team also upgraded upright vacuums to LEED certified Sanitaire’s Commercial Bagless models which have a washable sealed HEPA filtration system which captures 99.97% of dust and allergen particles. This model is part of their Green Clean line and is also CRI approved. Attached are further details of the new models our custodial team are using!